The Japan Veterinary Healthcare market is expected to register a CAGR of around 6% during the forecast period, 2018 to 2023. Veterinary medicines are associated with treatment, diagnosis, and prevention of diseases among animals. It covers a variety of animal species, both, in domestic and wild. The growing meat consumption, especially for chicken and pork, is adding to the exposure of dangerous foodborne pathogens. The E. coli and Salmonella infections cause serious diseases among people, and can even be fatal at times, which is possible during the intensive production systems. Moreover, there is a risk of emerging new strains of influenza viruses, due to the long distance transportation of animals. The farms are often in the same area, with a concentration of confined animals, which potentially enhances the risk of avian influenza transferring to pigs. The reassortment of the virus can lead to new strains and cause infections among humans. Further, these farms increase the risk of spreading and mixing of virus strains. Intensive farm practices are causing the risk of emergence of these bacteria in the food, as stressed animals become more susceptible to infection. The risk from zoonotic diseases is fuelling the market for Japan veterinary healthcare. Inter-Governmental Organizations and the food production are making reforms to ensure health by the process of surveillance and vaccination, investing in R&D, and transfer with respect to vet health. Additionally, advanced technology leading to innovations in animal healthcare and increasing initiatives by government and animal welfare associations in different countries are also factors responsible for the growth of Japan veterinary healthcare market. Advances in veterinary care, over the past few years, have come at high price. For example, according to the North American Pet Insurance Association, a trade group, it is estimated that only 1-2% of the total United States pet population was insured by 2015-year end. Hence, very few are insured and the remaining pet owner population has to pay the amount from their own pockets. But, as the costs continue to increase, the United States has spent a record of USD 15.4 billion on vet services in 2015, up from the USD 8.6 billion in 2005. The increasing costs is the major concern and also, many diseases and injuries are diagnosed with an MRI, which used to be inaccessible to all except to the most well funded university hospitals. The MRI machines are available in many hospitals, and vets use this test as standard care for diagnosing and treating cancer, epilepsy, injury, etc, but the test itself costs over USD 1000, since MRI machines are incredibly useful and important diagnostic tools, the cost of test is out of reach for many pet owners, who would struggle to afford the surgery and/or treatment following the MRI, let alone the cost of the test itself. Thus, increasing cost of animal testing and veterinary services is hindering the growth of the market. Also, lack of infrastructure and funding and use of counterfeit medicines are restraining the growth of Japan veterinary healthcare market. 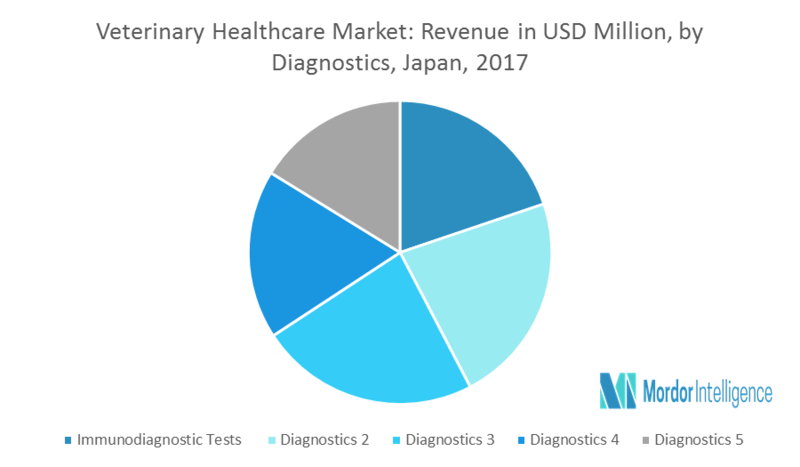 The Japan molecular diagnostics in Japan veterinary healthcare market is expected to register a healthy CAGR during the forecasted period due to the healthcare infrastructure in the Japan is experiencing positive trends in the R&D developments. Major Players: Zoetis animal healthcare, Merck, Elanco, Bayer healthcare, Ceva Animal Health, Inc., Virbac, Boehringer Ingelheim, and Abaxis, amongst others. 9.4 Ceva Animal Health, Inc.